In the past ten years the IRE was awarded several times for its involvement and commitment in the regions. In 2011 the IRE received the EUROPAN award by the European Forum Burgenland for its activities in the regions of Central and Eastern Europe. 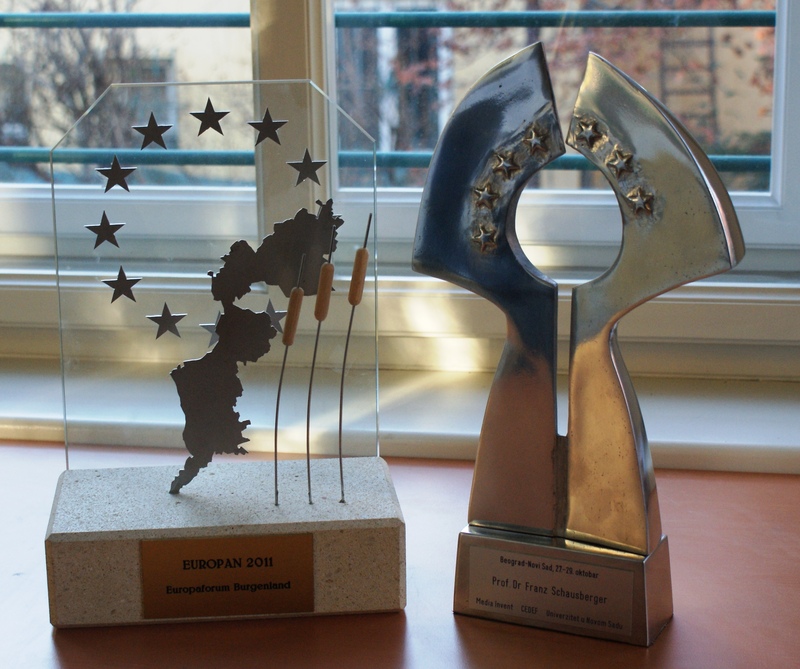 The European Forum Burgenland has the goal to go beyond borders, create a marketplace of ideas and act as a Pannonian think-tank (upper picture award on the left). The “Danube Flower Award 2014” of the Danube Business Forum was recently presented to Franz Schausberger and the IRE for its involvement and commitment in South-Eastern Europe. The “Danube Flower” is awarded to outstanding institutions and individuals who, through their work, dedication and creativity have contributed to the development of the Danube Region, the Danube Strategy and the promotion of its values. The “Danube Flower” Statuette is the work of painter Milivoje Unković from Serbia. The Fondation du Mérite Européen in Luxembourg awarded Dr. Franz Schauberger with the Order “Mérite Européen in Gold” (bottom picture) on 18 July 2015 for his extensive activity in the interests of the European regions as a representative of Salzburg in the EU Committee of the Regions for two decades, and for the creation of the Institute of the Regions of Europe exactly ten years ago. The Fondation du Mérite Européen was founded in 1970 in Luxembourg. The mission of the Foundation is to highlight the volunteer services of individuals beyond the normal level of commitment and to recognize organizations for special contributions to the promotion of the European idea and for exceptional European commitment.